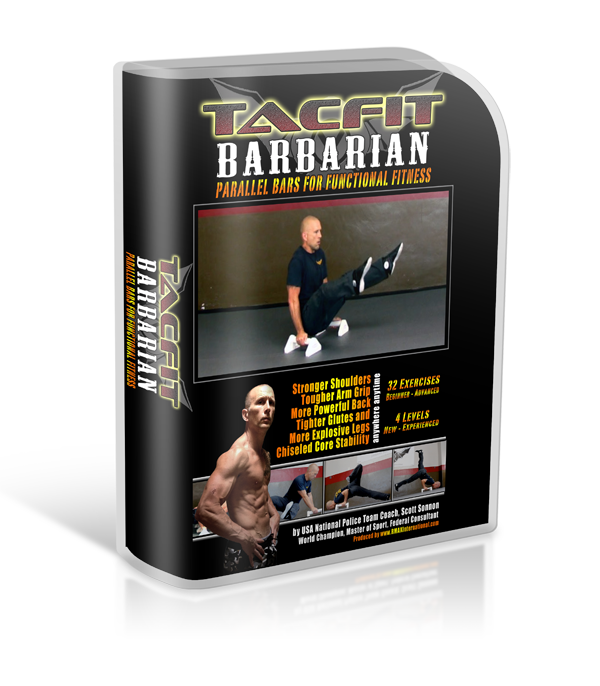 TACFIT Barbarian (TBAR) uses your bodyweight and a pair of inexpensive or home-made parallette or pushup bars to develop comprehensive functional fitness at home. Conventional gymnastics programs were designed for young children with the luxury of long training days, and the biological benefits of passive recovery due to young age. TBAR taps into Scott Sonnon's renown accelerated recovery techniques, allowing you to minimize training time to less than 30 minutes while preventing pains, aches and injuries. The rippling, functional physique of a gymnast, with the pain-free flexibility of a yogi. 4 workouts for all levels, full color instructional manual, plus follow along and instructional videos, special warm up and cool down as well as strain prevention and stress conversion mobility programs.